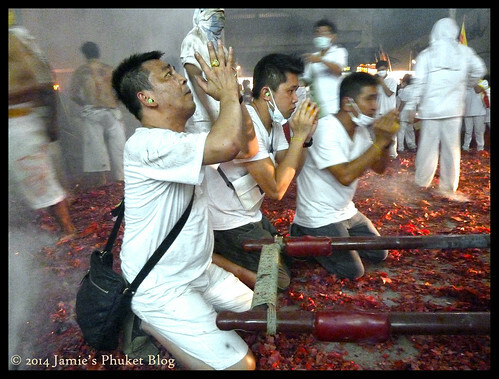 My favourite Phuket event finished on October 4th and there are already 2 blog posts online about the 2014 Phuket Vegetarian Festival - see Part 1 and Part 2. 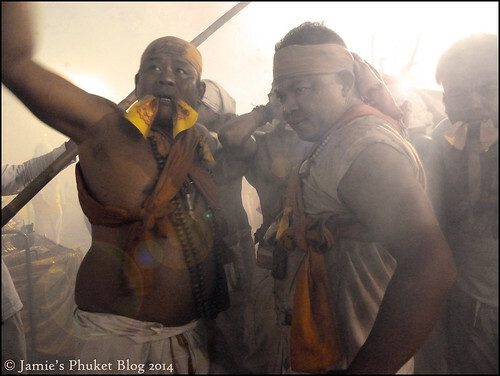 I wanted to see lots of the festival this year and thus we need 3 blog posts :) Part 2 covered the big street processions in town for the Bang Neow and Jui Tui shrines. Those are the biggest of the morning processions, and really are quite a buzz for me, even after many years. It's not to everyone's taste, can cause some traffic issues and some people just don't get the point of all the face piercing. Well, it's not your culture. This festival dates back about 190 years, is certainly not a tourist event and if you stick around the main beach areas of Phuket, which most visitors do, you really won't notice anything. 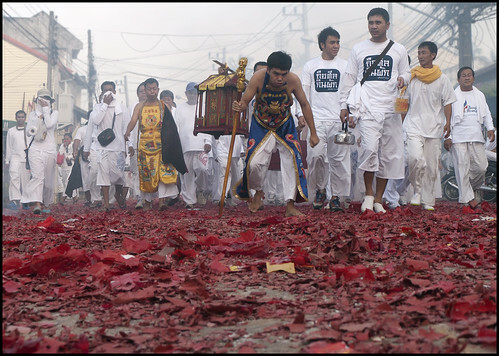 The big events happen at Chinese shrines around the island and the biggest street parades are in Phuket Town. It all started back in about 1825 when members of a visiting Chinese theater got sick when entertaining tin miners in the Kathu area of Phuket to the west of Phuket Town. Kathu is where this began, even before Phuket Town existed as a town. And Kathu Shrine had it's procession on October 1st. I tend to visit this shrine every year since it's very close to my house. Every year I try to get there really early, like 6 - 6:30am, and then realise that's not early enough. So, this year I was there at 5:30am. It was already crowded. The whole local community takes part as Kathu is very much a Chinese-Thai area and takes pride in being the origin of the festival. 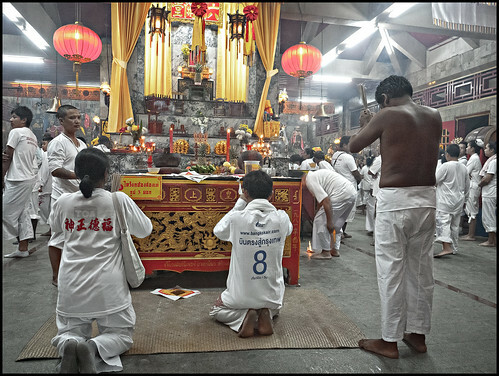 (above) Saying prayers at Kathu shrine - this photo taken at 5:40am on 1st October. 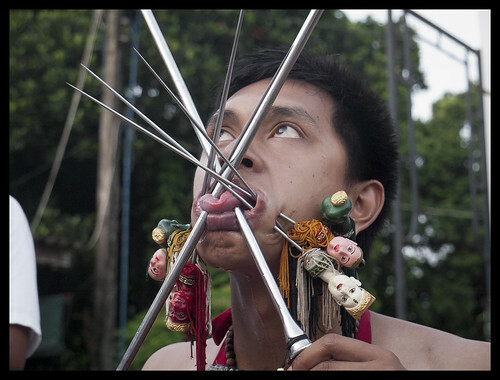 I have taken plenty of the face piercing photos over the years and Kathu has plenty of that. This year I wanted to try and capture what was happening inside the shrine as the entranced Ma Song came to the shrine before heading outside to get pierced. Managed to find a photo vantage point next to the main "altar". I think video would be better, will try that next year. The Ma Song are sitting around the shrine and then suddenly, one by one or in small groups, they start to grunt and shake their heads and in some cases dance wildly, slam their hands down on the altar and are dressed in their ceremonial outfits by their helpers. Hard to get a photo in the dim light with the camera I was using (an old Panasonic G1). The experience was worth more than the photos. Outside things get real busy after 6am. Ma Song are exiting the shrine every minute and finding a place to sit and get pierced. There are male and female Ma Song here at Kathu although most of the ladies are not pierced. It was not long before the procession started to form up and get ready for the walk to Phuket Town - it's something like 7km from Kathu, quite a walk on a hot day especially if you are carrying extra weight. Not long after the above photo was taken, the Ma Song start the walk to town. The procession seems a bit random, with people setting off when they are ready. 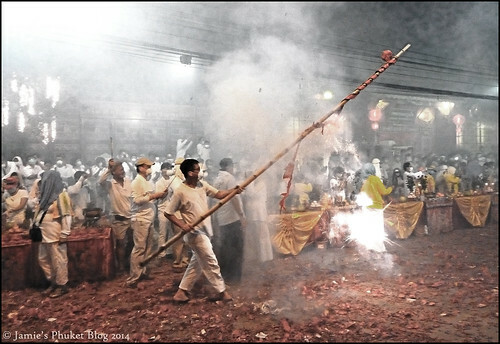 I waited a while outside the shrine, as my favourite part of the procession is in the rear - groups of guys carrying statues of the gods, and local residents throw firecrakers or hang long strips of firecrackers on bamboo poles and dangle them overhead as the gods are carried past. If you get in the middle of this, it's best to wear ear plugs and a mask. 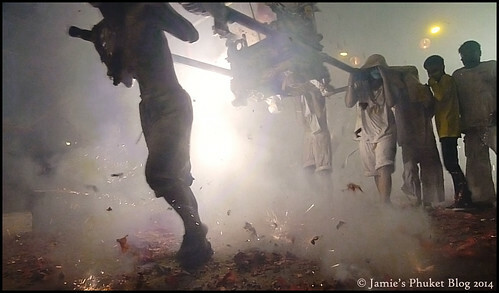 (above) Carrying the gods through the firecracker storm in Kathu village. This is still before 7am. The streets get carpeted in red firecracker debris. 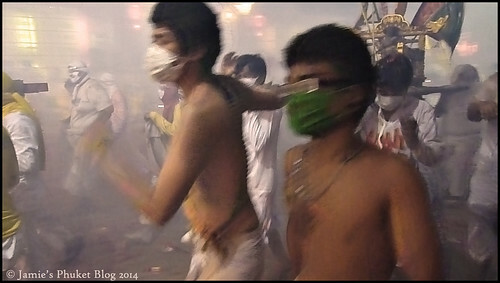 I'd forgotten to get a mask and a couple of times had to beat a hasty retreat as the smoke was too much. (above) The rear of the procession. This particular Ma Song, a young guy, seems to take on the form of a bent old man, walking with a stick. It is said that the Ma Song are possessed by spirits. I have no idea what is true, I have no reason to doubt what I see with my own eyes. If not true, there are some damn fine actors in Phuket! On the last night of the festival there is a huge procession in Phuket Town with Ma Song (not pierced) and hundreds of god statues being carried through the streets. I had never been into town on the last night until this year. Earlier in the evening all the shrines have a ceremony called "Crossing the bridge for purification" - we'd been into Kathu for this a few years ago and it was a lovely evening (see here). The crazy last night procession always seemed a bit too crazy to me, but this year, properly equipped (long trousers, running shoes, long sleeved white shirt, facemask, cotton wool plugs for the ears) it was time to get a new experience. And it was worth the effort. I will certainly go again next year, armed with a better camera I hope and a better knowledge of where to get the best views. I went in with the family although my wife and kids soon retreated to a safe distance, and met Tim along Phuket Road near the large roadside shrine set up by the Phuket Town municipality. At one point with the smoke getting too much I retreated behind this shrine and found myself standing net to the Mayor of Phuket Town! A few photos ... I tried to get close to the action! The procession goes on from about 9:30 / 10pm until midnight or later. As I was there with the family, I did not stay too late - the photos above were all taken around 10pm. It gets wilder later on. I think I better aim to be in town until after midnight next year. This was just a taster! While waiting on Phuket Road for more of the procession to pass I became aware through the constant din of firecrackers that the next street over (Montri Road) seemed noisier, so I found a shortcut and found myself in the middle of a firestorm! 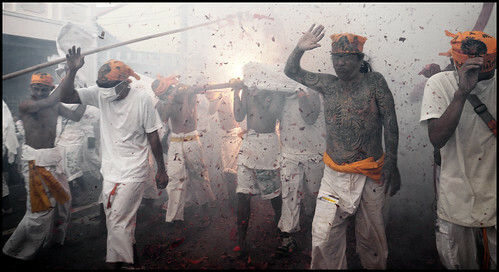 Along with the firecrackers, piles of paper were being burnt in the street as the gods were carried past. Chaos and one facemask was not enough! But as the madness eased for a second I got one of my favourite photos from this year's festival. 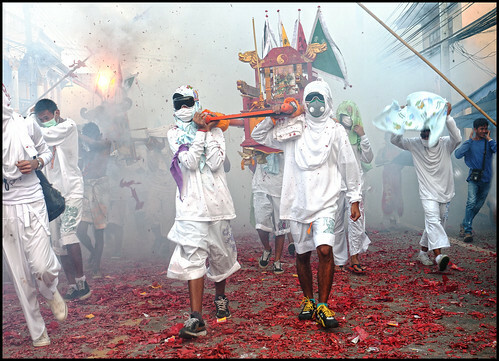 And that just about does it for the 2014 Phuket Vegetarian Festival, except there is a second festival this year from 24th October until 2nd November, as there are 2 ninth lunar months. I have no details of what will happen during this second festival. I get the impression that the answer is "not much" except for maybe another 9 days of vegetarian food for the faithful? I'll post any info that arises on my Facebook Page or you can follow me on Twitter for Phuket news and more. See you in Phuket!